I'm a notorious over packer - I honestly can't help it, that was until this last trip to Charleston! I was very adamant about preparing what I was going to wear every day and night and laying items out to ensure that I didn't take anything that wasn't needed. Don't get me wrong - I can pack everything into one carry-on, but I always end up over packing and not wearing half my clothes. I was on a mission to have space left over (really good since I ended up buying a few items) and here's how I did it. 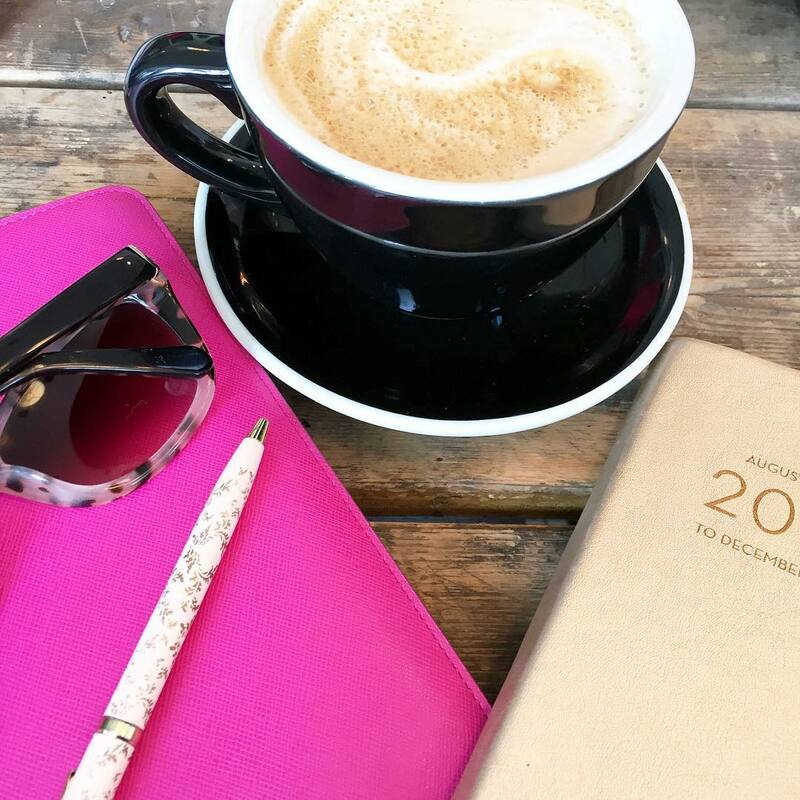 I also have a few little tricks I like to use while travelling so keep reading! First things first - the luggage. Last year we decided to ditch our soft sided carry-on's that were always bulky and puffing out for the hard case ones. They are light weight and easy for anyone to lift into the overhead bins! We found ours at TJ Maxx, but I found our exact pair for the same price on Amazon! I like them for a few reasons, but the main one being they are TSA approved so you're never questioned if they fit in the overhead storage! When it comes to packing I don't necessarily have a method that works the best - like only rolling clothes or only folding clothes - I sort of do it by the article of clothing I'm working with. 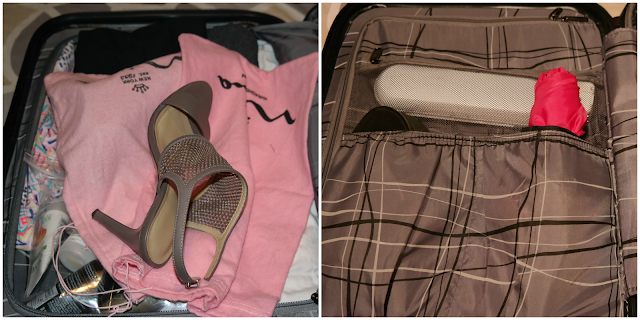 On the left side I start with things I always know I need to pack including delicates, hair tools and purses. I also add in some heels and my pj's. I always make sure the shoes I'm bringing have dust bags - you'll notice the black flats I pack in the front fit perfectly in the pocket so I didn't worry about a dust bag for that. After closing that side up, I put in things that I might need to grab for easily like my charger or umbrella. I would like to point out that I only brought three pairs of shoes on this trip - one of the pairs I wore on the plane. 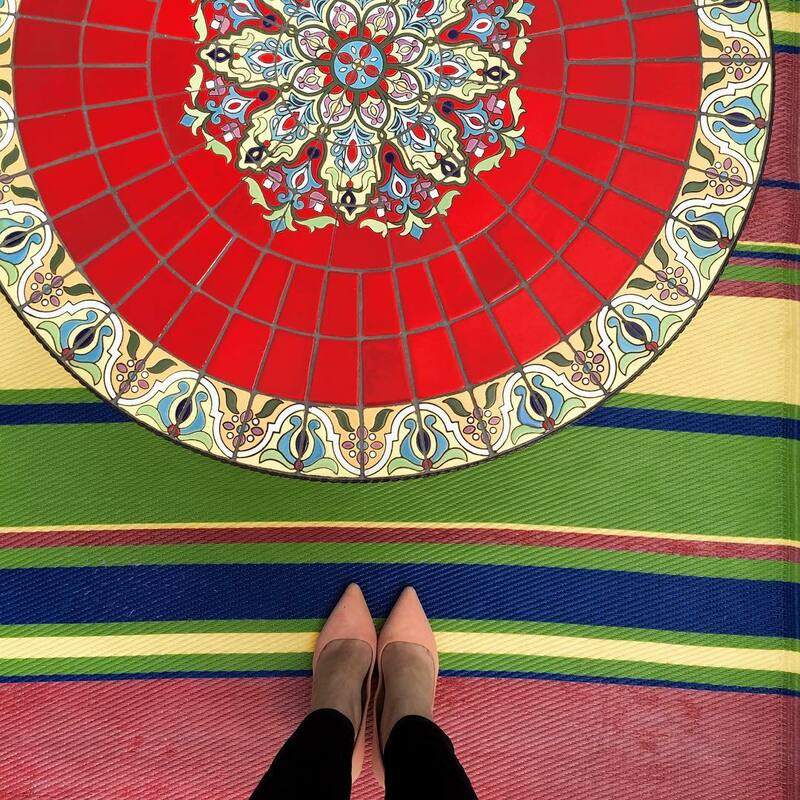 That is due in part to my amazing heels that match everything! On the right side is where it starts to get a bit tricky, but there is a method to the madness. I start with heavy items like jeans and fold them on the bottom. Then just layer to the top finding little crevasses where things can easily fold into or be rolled into. I also like to add a few dryer sheets so that when I open my luggage it smells fresh like it just came from the laundry! I still have lots of room so that's where my toiletries, makeup and jewelry come in. I like to pack everything that is used for hair, in the shower or at night in it's own Ziploc bag. Sample sizes are where it's at when travelling. I mentioned in my recap that the evian mist spray was our life saver and it's amazing to spritz after long flights for a quick wake me up. 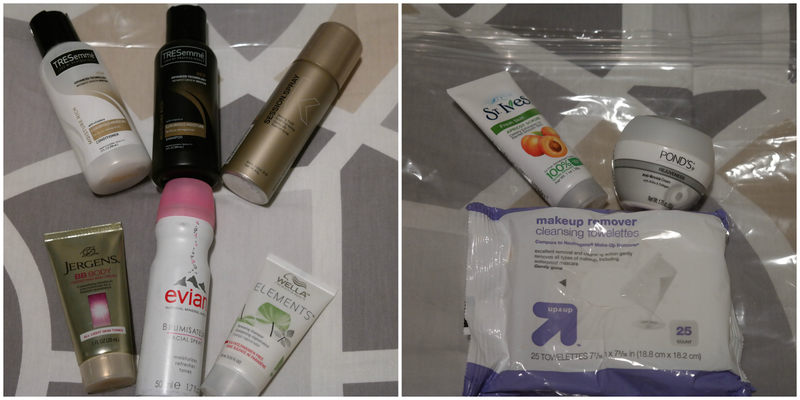 Make-up wipes are another item I only use while travelling since hotel soap is so hard to remove makeup! I like to lay out my options for jewelry and this is probably where I over pack the most. I took some heavier earrings but honestly my lobes weren't feeling it so I stick to the others. One necklace and a few bracelets that I can layer is all I need. 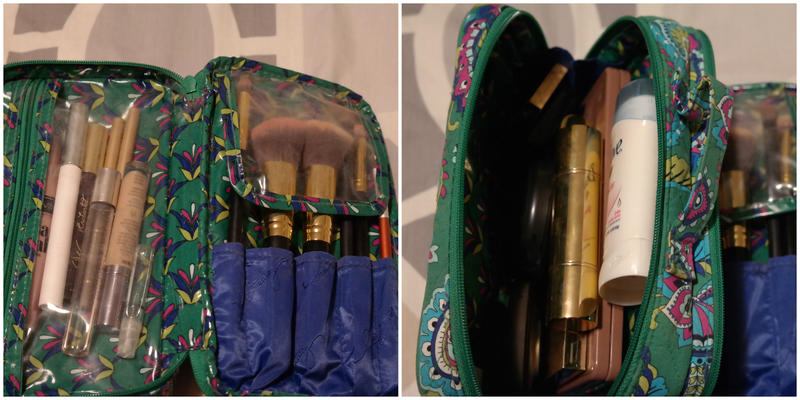 My sister bought this travel jewelry organizer with me a while ago, but I really like this Vera Bradley one. This is the makeup that I took with me to Charleston and I seriously didn't pack as much as I normally do, but I could have done without the mini travel Tarte palette I brought. All of this fits into my vera bradely makeup travel tote - same bag I bring with me when I go to the gym in the mornings. Things that can leak or need to be separated I put into another Ziploc bag and then I'm DONE!! What's your method to packing? This is great! I don't normally put much thought into trying to park "smart" b/c I always just overpack. Ha! I might try to use these tips, though, on our next trip! You are such an organized packer girl! Love that jewelry organizer, I need something like that. And I need a new suitcase! I've had mine since college LOL! Wahhh this makes me wish we were packing to go this weekend! I love the idea of putting in dryer sheets to keep things smelling fresh. Great suggestion! Love the jewelry carrier that you have! I always have the hardest time packing my jewelry in a way that I'm not untangling things when I want to wear them! These are great tips! I always rely on a plastic bag for those leak-able toiletries. I really need to replace my luggage with the hard case one like yours. Okay you are an awesome packer. I love the clean and laundry bag. I always try and keep those separate and that is a perfect way. The jewelry case is super cute too. I think I need to make the sitch to the hard case, mine always looks so bang up after a few trips. I love how organized you are! I usually wayy over pack, especially on the makeup! The dryer sheets are a good idea! Who doesn’t want fresh smelling clothes when they arrive?? OMG where is that little laundry bag from?! So cute! I either overpack or grossly under pack... but like you, I've traded soft luggage for the hard side luggage! I can't believe how light they can make it!! I remember when I thought my soft luggage was light!! I'm impressed with your packing skills! I usually drive wherever I'm going so I get to overpack as much as I want and not worry about things fitting into one carry on suitcase. When I have to fly... it's a struggle! You rock! I'm definitly an overpacker, too! I like to have "choices." Ha! Like we're going to NOLA for only two days and I've totally already over packed! i do a lot of the same--rolling items, dryer sheets, and plastic bags for anything that can spill. love the tip about the hard suitcases--i'll remember that when i upgrade! That makeup travel tote is great! I am always so scared my makeup is going to burst and get all over my clothes. Need to invest in one of those! Yes to the dryer sheets! I just started making an effort to not overpack in the past year and it is SO nice to know exactly what you're going to wear every day - one less thing to worry about! I definitely need one of those VB jewelry organizer bags because jewelry is my biggest packing struggle! Packing is a science, everyone does it differently! I never thought of the dryer sheets, totally doing that on my next trip! These are such helpful tips. I too switched to a hard case suitcase and love it. 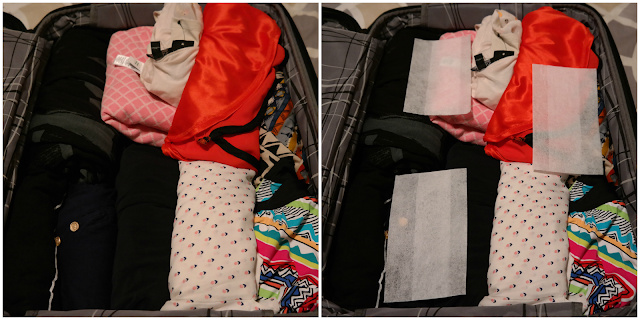 Totally adding dryer sheets to my suitcase the next time I travel, such a great idea! I love your travel makeup bag. So fun. Bringing some tampons and pads is also a good idea. Someone might be glad that you did! I am that person who will get her period at the worst times. These are great tips. We're packing everything into carry-one next month because I don't want to pay to check in bags. I'm notorious for overpacking too, I need options! Haha. Adding the dryer sheets is such a great idea and I am totally copying it! The dryer sheets are GENIUS! This is WAY more organized than what I manage to pull together, but I love the dryer sheets idea- GENIUS! Dryer sheets are a great idea! I'm always really good about rolling my clothes and packing well when I leave for a trip, but when I come home my suitcase is a disaster - I just stuff everything I can. I try and only use a carry-on bag when I fly, so one of my quick tips is to keep your liquids in the outside zipper so it's easy to pull out for security. How organized are you?! I am in the process of packing now and I'm basically just a cluster. I definitely need to take some of your advice haha! I have been wanting to try the evian mist spray, so glad to hear you like it! Love this,so great! I am definitely an overpacker but I am really going to try to do better for a trip to Tulsa we have coming up! I like the dryer sheet trick! Also, what is that gorgeous palette in your makeup photo? The one above the Too Faced Chocolate Bar palette? It is so pretty! I wrote a comment and it vanished :(. You're a great packer! I definitely picked up some tips here - I need to look into that VB makeup case. I have one myself, but it doesn't have the brush compartment - that would make things so much easier! I loved a few of your packing ideas !!!! Never thought about the dryer sheets before - LOVE THAT ! I'm currently packing for our trip to the Bahamas on Friday and I'm trying very hard to not over-pack! But it's just so hard! 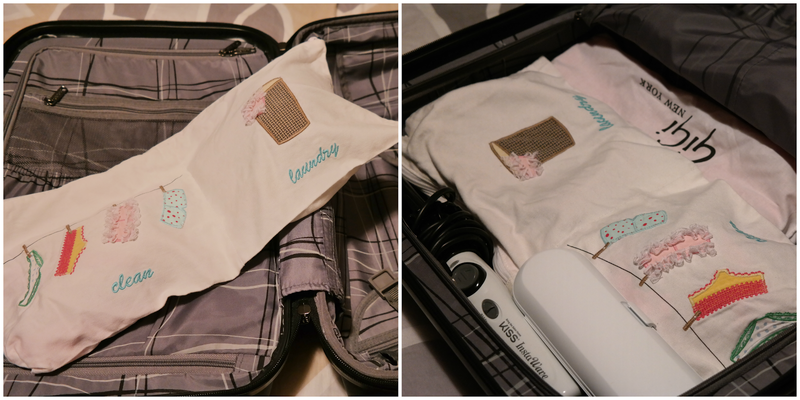 Sharing what I'm packing tomorrow :) Love your ideas! Great tips!! That's a great idea about the dryer sheets, never would've thought. And my roomie gave me an almost identical jewelry travel case (except yours is a little more colorful) and I love it so much. Use it ALL the time. Ps. About the earlobes, do you ever wonder if they're gonna be super stretched out when we're older due to heavy earrings?!? I tooooo am notorious for over packing... I just get really nervous that I will miss not having something while away! We also made the switch to the hard sided suitcases and we will never go back to the soft again! such a fabulous post, B! I'm the same, I don't roll my clothes or anything, just pack the heavier things first and then try to fit things around it all. That travel jewellery bag thingy is legit the best thing I have ever seen. I have been wanting one but most travel jewellery thingys are really big and long, i love how small that one is! I don't have a particular method to be honest. I usually put pants first, then layer tops, shoes and make up bag. My husband though layers the underwear below , then tops then pants and jackets! I'm all about versatile shoes too...that way you need less things and have more space! I don't have a particular method when it comes to packing, I just always, always end up taking more stuff than I need haha :) I love that jewelry organizer, by the way! Amazing tips, lady! you know I'm a huge over packer, haha. Love the tip of adding dryer sheets to your suitcase. What a great idea... I hate how suitcases smell sometimes! The dryer sheets is an excellent idea...never throughout of that! I'm notorious for overpacking but a LOT as in I could never fir everything into a carry-on size bag. Im thinking my toiletries bag is one major problem and need to slim it down to the bare essential like you have. That travel jewelry bag is perfect, I've never seen one of those before! Love hard case suitcases, I used to have one and then switched back to soft because i wanted and exterior pocket for my laptop or small items...kind of miss my hard one though. I love drier sheets - I keep them in my drawers at home too. Great packing tips! I will have to keep this in mind for the next time I take a vacay! You are SUCH a much better packer than I am! Dust cloths for your shoes, are you kidding?! Do you make them or buy them? I just throw mine in, probably right on top of a white t-shirt... And I'm an under-packer. I hate having excess crap around so I think that I can wear that same white tee more than once... Until I get something on it and have no backup. Oops. I could use your tips for sure! Such great tips!! I love the drier sheet idea! I try everything on and only bring what I need - I'm better off like that, and I waste no time while I'm actually away trying to see what looks good together. You are so organized! I always try to pair one or two pairs of shoes with everything I am bringing to make it easier. Usually I wear one pair and only bring one other. I love that jewelry bag organizer! I don't have one but totally need one. I love the idea of dryer sheets too, so smart. Packing really stresses me out... I'm so impressed with your organization! While I love cute organizers for products at the end of the day Ziplock bags are the way the go. I needed this o so bad!! I am notorious for over packing--I go to out of town friends houses just for the weekend and they ask if I am moving in ha!! Looks like you girls had just the most fabulous time!! Great tips, I am such an overpacker most times. I am in need of some new luggage and always look at that kind at TJ Maxx and Marshall's...thanks for the information about Amazon! Such amazing tips Biana! Thanks for sharing! OMG this is too funny! 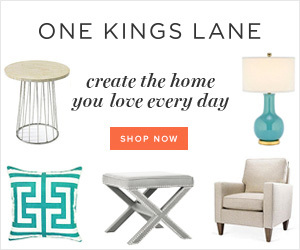 I just found your blog after visiting Louann Kristy's blog, and was intrigued by the title of this post! I am now one of your newest followers! There are so many coincidences in this post! I was on a Girl's Weekend this past June........went to my cousins vacation home in Truro (near Boston!) We took the ferry from Boston to Cape Cod. Ready for this? I bought my luggage from TJ Maxx too!!! Bought it early June I think (online), they had a sale. Got the same one as you only mine is leopard print! I pack pretty much the same as you as well.......but I LOVE, LOVE, LOVE your dryer sheet idea and hope that I remember that! Sooo happy to meet you! Great tips! I love the idea of putting a dryer sheet in your luggage. Brilliant!! Love this. Mainly because Im nosy and love to see what other people pack in their suitcases. Crazy right? And love the suitcase colour. Its perfect. I love those hard suitcases too! They are the best and somehow always seem to hold more. I always try to limit the number of shoes because they take up a lot of room. I try to plan my outfits so I can keep wearing the same ones all weekend. I love the dryer sheet idea! Ive never seen that before, but im sure that adds a nice, fresh touch. Thanks for sharing! I love this packing method! 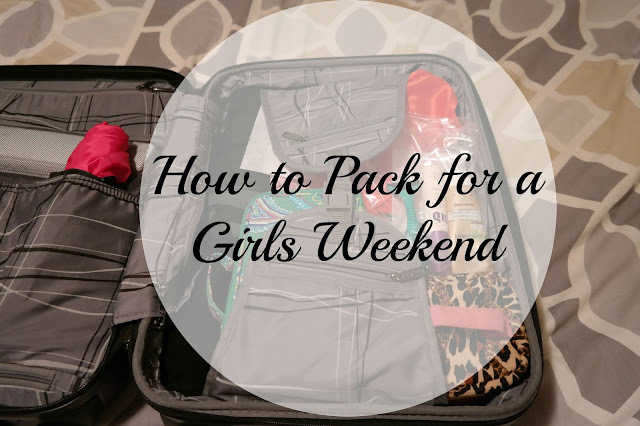 I'm seriously the worst packer of all time - there are great tips! Awesome finds, I was using the same bb foundation you have but I recently changed to maybelline matte and poreless it lasts way longer. Love the purse, pink is my favorite, and it has so many compartments too which is great, I'm also crushing on the makeup kit that your sister got you gorgeous!